We were just getting ready to go out for the evening, when three cars parked at the top of the road, effectively blocking our car in. People tumbled out of the cars and began milling about, taking photos and talking loudly in English. In the centre of this mêlée was Maria, who we purchased our house from. I walked up to ask them if they could let me move my car when I was spotted by a stout man who strode towards with hand outstretched, I took his hand and as he pumped my arm up and down vigorously, in an American accent he told me he had come to take photos of the old family homes. Maria saw me and explained that this gaggle of people were a mix of first and second cousins from Philadelphia. Turns out the late Zio Gasparino who owned our house for a while has a brother who left for America years ago, and who is now in the late autumn of his life. The family have come to take photos of the area that he played around in as a child and the family houses he knew. I’m having questions fired at me faster than balls from a tennis ball machine on a high-speed setting. They take photos of my house and need little encouragement to wander around the rear of the property. They brave the brambles to take photos of the old ruin above the lane, turns out this was also one of the families homes. The youngest member of the group accepts my invitation to give me his email address so I can forward him some interior photos of our house. We’re running late for our dinner with friends, so leave an exited group of Americans with cameras roaming the Italian countryside collecting memories. The Brothers Johnson are playing Stomp, as I walk along the lane. It’s a warm and sunny afternoon, perfect for a leisurely stroll. 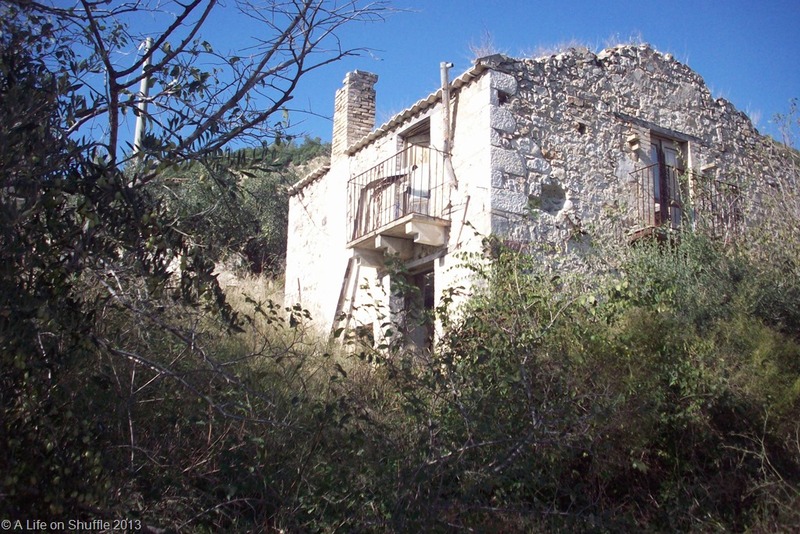 The Italian countryside is filled with unloved and unwanted buildings. The reason for this is a culmination of unemployment and the antiquated, convoluted inheritance law. You can understand people moving to where the work is but as it’s unlawful to disinherit your children, so, even if you have a disobedient first son who brings shame to the family door, he’ll still have automatic entitlement. The shares of your estate go down in fractions depending on your living relatives, meaning one property could have as many as fifty-owners, with Luciano in New York owning a third of the attic room, while Maria in Torino owns the doorstep. This plethora of properties means that Italy is still a good place to buy a holiday bolthole, and falling prices mean the buyer is in a good position. The only problem is getting all the owners in one place, at the same time. I have met an English couple who told me there was fifty people crowded inside the notary’s office when they signed for their little house in the hills. Nearby is a ruin, two small one storey houses side by side, I take the ear-buds to my iPod out, just as Ultravox begin to play, Visions In Blue, letting them play on without an audience. I step inside one of the houses. The stone walls are solid, at least half a metre thick and the oak beams look like they’ll still be doing their job in the next millennium. The doors and windows have gone, possibly removed for firewood, and a simple chair lies broken upon the floor like a wooden corpse. There is only two rooms, one has a manger, cage and a stall, obviously the animal housing. But what’s this in the corner, a wood burning oven. Surely if you have animals, you have straw and hay, so isn’t an oven in a stable a little risky? I like to think that the owner was so caring, that on cold winter nights he lit the oven to keep his donkey warm? I move back into the other room, its ceiling is testament to Italian ingenuity, but an health and safety horror. Bamboo that grows in abundance here and the rafters are canes that have been cut and laid side by side. 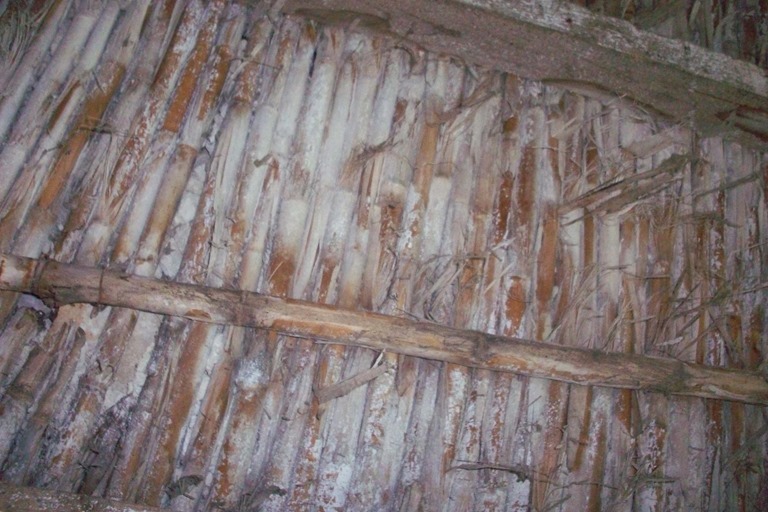 Other canes and an assortment of branches and planks make up the cross beams. This all sits upon the oak beams and sitting on top of this ancient and dry bamboo is a roof made up of ochre and terracotta coloured tiles. It’s amazing to think many years on, all this weight is supported by something as slender as bamboo. On the floor is several crates of passata, homemade tomato sauce, abandoned like the bricks and mortar. 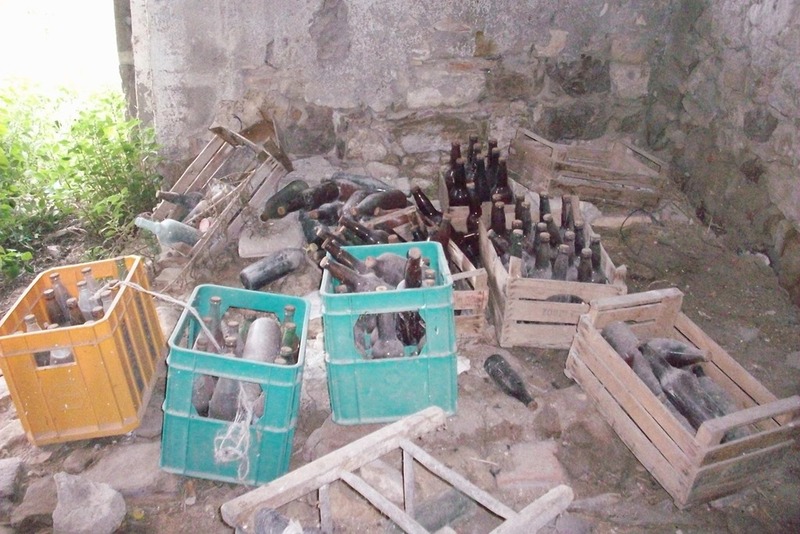 I estimate that there must be at least one hundred and fifty, mostly brown beer bottles of the reddish brown liquid. They say storing passata in brown glass keeps it fresher. I pick up a bottle and break off the cap, the heady aroma of tomato fills the air, it still smells good, I can imagine women de-seeding and skinning as the sun shone, while the men drank beer and lit a large fire for the sterilising of the bottles and eventually sealing them. I pour a little out onto the stone floor, it looks good enough to eat, however I’m wouldn’t be game enough to try this batch. I replace the bottle, step over the skeletal chair and leave the house. Outside, replace my ear-buds; Kate Bush is singing, Mother Stands for Comfort, and I continue on with my stroll. 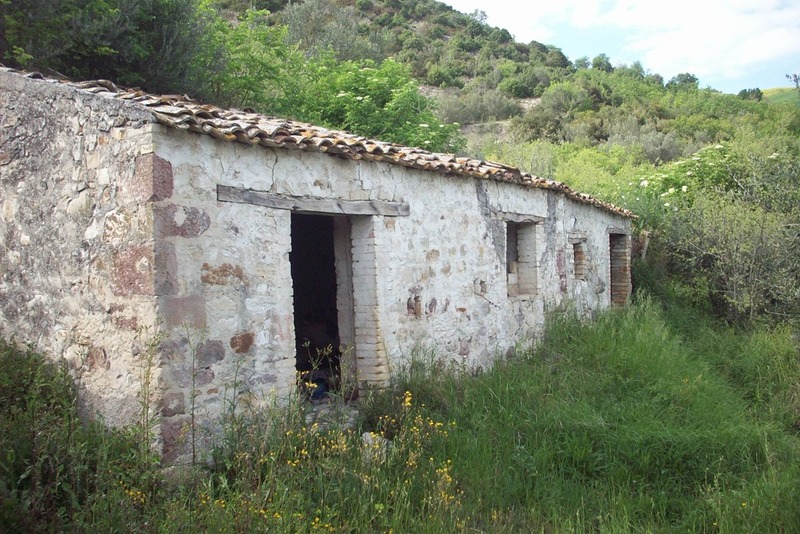 When we purchased our little piece of Italy, namely a five room house with lots of neglected land I hated the old ruin that was opposite. We soon discovered that the ruin was part of an old palazzo and as it had become unstable the owners were told to take it down. Three of the owners removed their properties, however one remained standing; or literally clinging on. 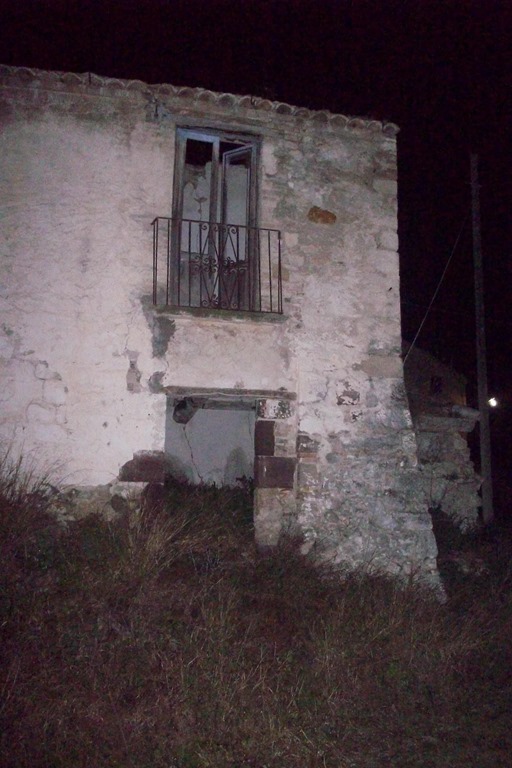 We discovered this small ruined house belonged to Domenico. A small, wiry septuagenarian with a personality akin to that of a terrier. It appears that Domenico thinks he can get away with just removing the roof. I can see his point, why spend your own money when no one lives nearby, however now someone does live nearby, in fact just 4.5 metres away. Our lawyer said we can let the comune (council) know and they’ll order it taken down. However not wanting to upset the locals I said leave it for now, thinking at least it keeps our place hidden from the road: What a mistake that was, hidden away we were burgled twice in 2012. Now that I’m getting settled into life here in Abruzzo and restoring our house I’ve grown quite fond of Domenico’s ruin, especially on nights like this. Streisand, sings, With One More Look at You, I take my glass of wine outside where there’s very little light pollution and the evening air clings to the remnants of the days warmth and it stands silent, a sentinel looking over the valley. There’s the sound but no sight of wildlife and everything feels good with the world. I grab my camera and fire of a picture of the ruin; a memory frozen in time of this quarter of a palazzo that was built more years ago than anyone can remember; the last restoration previously done back in 1931. Maybe, I’m losing my Englishness and unconsciously embracing the Italian way of thinking. Perhaps living with a ruin isn’t too bad. It certainly puts things into perspective. There are more important things the worry about than if a pile of bricks looks unsightly, but then again there’s that old cliché about beauty being in the eye of the beholder. There’s a breeze as the music shuffles and Depeche Mode begin to play, Halo. Perhaps I’ll take my wine back inside and leave the ruin to stand alone inside the inky blackness of the Abruzzi countryside. I close my front door as Dave Gahan sings the lyric, ‘When the walls come tumbling in.’ Let’s hope, not tonight, I’d like some more time with this ramshackle old building.